When Nikon announced the Coolpix A in 2013, I spent a few minutes ogling it online, but I knew it wasn’t for me — with a price tag over $1000 and not-so-fast autofocus, it wasn’t a good value. That has changed. These cameras have begun to appear on the used market for around $300 in very good condition. I got this one for $320 in its original box with CDs, instruction manual, warranty card, USB cable, battery, charger and (unused) neck strap. The 16 MP APS-C sensor is a champ — I’m quite familiar with it, since the same sensor is in my old Nikon D7000 and in my Pentax K-5. What’s different is that the Coolpix A packs that relatively-large sensors into a genuinely tiny camera. I suspect that the reason the price is so low on these cameras is that they don’t have built-in WiFi, a feature available in most new compacts. Of course, you can wirelessly transfer photos with an Eye-Fi card, or you can use Nikon’s Wu-1B adapter, which will also allow wireless control of the camera from a smartphone or tablet. Autofocus is so-so, but as a walking around camera it is more than adequate. And it looks completely harmless, which might be an advantage. There are some venues where “professional-looking” cameras are forbidden (sporting events, concerts), but where point-and-shoots (and camera phones) are permitted. With a wide-angle lens, this camera wouldn’t be much use in a football stadium, but if you can get close to a stage or close to the action, photos from the Coolpix A should be real keepers. I’ll post again when I have sample images to share. 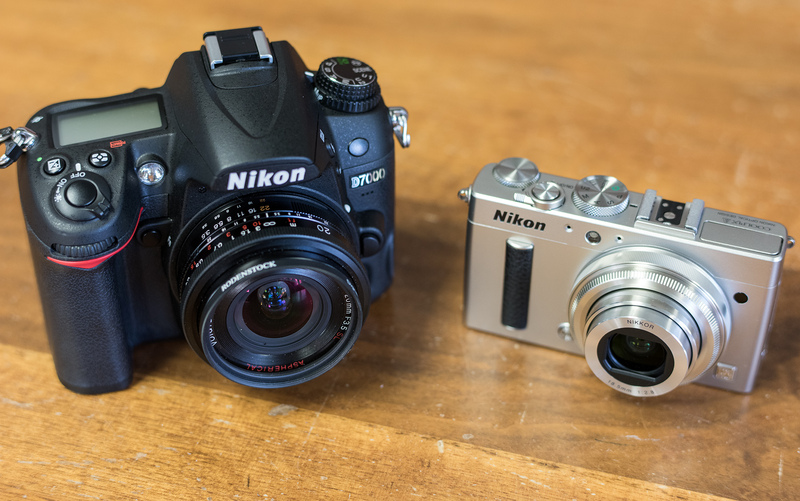 The Coolpix A shares an identical sensor to the Nikon D7000. The built-in 18.5mm lens offers a similar angle of view to this Voigtlander 20mm prime (but offers autofocus and a larger maximum aperture).